This product has been discontinued, but we made a better one! 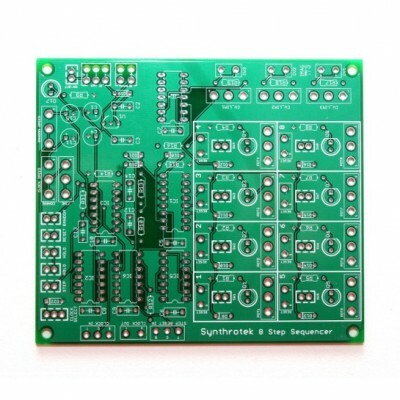 Check out the Sequence 8, available in 9V and Eurorack format. Sequence length can be adjusted from 1-8 steps with modular-style jack inputs. Reset button sets the sequence immediately to the beginning. 3 CV (Control Voltage) outputs allow for multiple synthesizer synchronization with independent threshold adjustment from 0-9V. Dual Clock Speed Controls (Coarse and Fine) gives users the ability to match the tempo for playing live or in the studio! Knobs and Switches – get your hands on it! Why don’t u sell the 8 or 10 Step Basic Analog Sequencer anymore? I would really like to by it. The 8 step is small and great fun, and much cheaper than the 16 step. I would really like to get my hands on the 10 step kit… Please ring it back…? 8 steps, and much better than the last. My build of the new 8-step kit. I built an APC into the same enclosure. It’s a blast! The video linked below shows the final product driving a Korg Monotribe clock with the CV pushing the in-house APC, which is routed into the Monotribe’s filter for some LFO action. I would like to order an 8 step seq. kit. how much does the bare bones kit cost. We now have an 8 step kit in the store!